Each planner page is available in two versions: individually as a free PDF download, or as part of a collection for $9.00. The free version (below) is an individual PDF file (which you can view and print with Adobe Acrobat). The $9.00 collection (shown below) includes PDF versions of all of the Pocket-sized organizer pages featured on this site — more than 30! Download the entire collection at once, and use all of the pages as often as you want. 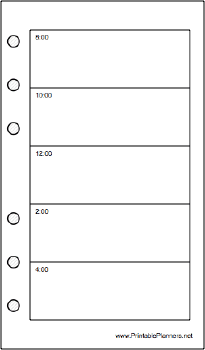 Planner Page collections are available for each of the planner sizes featured on this site. You can pay using your PayPal account or credit card. You'll be able to download the collection within moments. Printable Planners require Adobe Acrobat Reader or another program that can display the PDF file format. The paid versions are downloaded as a ZIP file, so you'll need a copy of WinZip, Stuffit Expander, or another tool that can open ZIP archives.